Bangi, 24 Nov. 2012 – The National Universiti of Malaysia (UKM) is to build an Alumni Complex, expecting to cost RM25 million, which will be a new landmark for the university that will bring together its alumni from all over the world. Vice-Chancellor, Prof Tan Sri Sharifah Hapsah Syed Hasan Shahabudin said the construction of the complex would be a crowning success for UKM for producing almost 160,000 alumni since it was set up 42 years ago. UKM are now spread out all over the world in at least 50 countries in the world, apart from Malaysia. 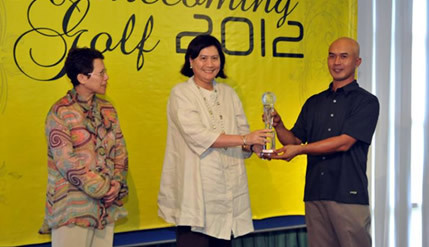 Prof Sharifah Hapsah said this at the presentation of prizes to golfers who took part in the Alumni Homecoming 2012 at the Danau Golf Club, Universiti Kebangsaan Malaysia hari today. Some 144 golfers took part, mainly UKM alumni, with prizes including two cars. 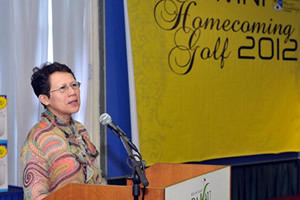 She said the Golf Homecoming was a good start by Alumni Office to bring together UKM alumni for meaningful activities such as the building of the alumni complex. She urged the participants to join in the campaign among the alumni to ensure the success of the project which would be a pride to UKM. She said UKM alumni should emulate the alumni of other well-known universities who played an active role to push their alma mater to be reputable universities. UKM alumni should come back by making meaningful contributions together with the university to put UKM in the world-ranking league. Tunku Ampuan Besar Negeri Sembilan Darul Khusus, Tuanku Aishah Rohani Binti Almarhum Tengku Besar Mahmud, Pro Chancelor Tunku Laxamana Dato’ Seri Utama Naquiyuddin Ibni Almarhum Tuanku Jaafar, Tun Ahmad Sarji Abdul Hamid and Tunku Panglima Besar Kedah Tan Sri Tunku Putri Intan Safinaz Binti KeBawah DYMM Tuanku Sultan Haji Abdul Halim Mu’adzam Shah also attended the Alumni Homecoming Golf 2012.